Being in charge comes with a lot of responsibility. You’ve got to see both the big picture and the small details. You’ve got to have a vision for where you are going, even if your team can’t see it themselves. You’ve got to KNOW what’s most important to you, whether that’s money, time, fun, passion or anything else that drives you to keep it going every day. For me, it’s working with my team, it’s teaching them, it’s letting them go and it’s watching them become. I love creating leaders. And, I like to have fun. As a leader, I’m aware of the variety of ways one leads. Everybody has their own perspective on this; mine is to build a strong team. For myself, I want to enjoy my people. I want to look forward to coming to work every day because I spend all day with these people, they are family. I believe that a strong team can take you anywhere. A strong team will lead you to achieve any goal you may have…IMHO. There are a lot of things I do, both simple and not-so-simple, to bring our team together. If you’re a leader who believes your people are everything, here are 5 simple things you can do, on the regular, to bring your peeps together and make them feel at home. Bring lunch in once a week or create a schedule where your people can take turns bringing in lunch. I’ve been bringing in lunch on Friday’s for a while now. We don’t all eat together (which would be an awesome bonus) but bringing in lunch is an awesome treat that your team really appreciates. Recently, I’ve created a schedule for each person on my team to bring in a lunch, which we pay for, for the entire team. So far, it’s been pretty fun seeing what everybody brings in, and it’s no doubt a challenge to their cooking skills. 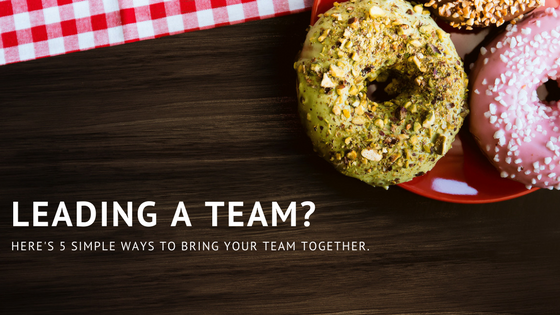 Surprise the team with doughnuts, bagels or afternoon cookies. Food is a real thing! It creates happiness and excitement, and it’s historically proven to bring people together. Doing things like this always makes the team happy, and lets them know that you are thinking about them, you care. Also, allow your managers to do the same thing for the team. Support their decisions to take a group out to lunch or coffee, or bring bagels in themselves. These are small expenses that make a big difference. Spend time individually with your team. Obviously, if you have a large company, you can’t meet with everybody so focus on your managers and teach them to do the same with their teams. I have mentoring sessions with my team individually, once a month. It’s made a HUGE difference in our relationships, and it allows me to accomplish one of my primary goals, which is to mentor my team, and it costs nothing but time. Give away random fun prizes. I got this idea from a friend and I love it! In our office, we have a prize wheel with everybody’s name on it and now and again I pull it out and spin the wheel. Whoever’s name it lands on gets to pick a gift card out of the goodie bag. This would be a great thing to also do when an individual in the office has a great success or accomplishment. Take the 5 Love Languages quiz as a team. This is a super fun idea and a great way to really get to know who your people are. If you haven’t read the book The 5 Love Languages I would suggest you get right on that, it’s a short, easy read and well worth the knowledge you gain about yourself and your loved ones. Having your team take the free online quiz gives you so much insight into what they need as humans and delivering your team feedback in their love language is powerful stuff. Once everybody takes the quiz, have a love language luncheon where everybody can learn about each other’s love language. Now that’s fun team bonding! A quick shout out to Marie Forleo for giving me this great idea! I’m always looking for ways to bring my team together, and I’d love to hear what you are doing out there in the leaderverse. Please share with me, and anyone reading, in the comments below what you are doing to bring your team together.